Hungarian Orientalist; born in Stuhlweissenburg, Hungary, June 22, 1850; attended the gymnasium in his native town, and continued his studies at the universities of Budapest, Berlin, Leipsic (Ph.D., 1870), and Leyden. In 1872 he became privat-docent at the University of Budapest. In 1873, commissioned by the Hungarian government, he undertook a scientific journey through Syria, Palestine, and Egypt, spending several months at the Azhar mosque in Cairo, where he attended the lectures of learned sheiks on Mohammedan theology and the science of law. In 1894 he was promoted to a professorship—the first instance in the history of the Budapest University of a Jew being admitted to the faculty. Goldziher is a member of the Hungarian Academy of Sciences, corresponding member of the Imperial Academy of St. Petersburg, honorary member of the Royal Asiatic Society of England, and corresponding member of the Jewish Historical Society of England and of other scientific societies. He was appointed to represent the Hungarian government and the Academy at many congresses, e.g., at the first meeting of the Association des Académies, held in Paris (1901). At the Oriental Congress in Stockholm (1889) he received the large gold medal. He holds the office of secretary of the Jewish community at Budapest, and since 1900 has been lecturer on religious philosophy at the Budapest rabbinical seminary. Goldziher's chief importance for Semitic history and philology rests on the fact that he was the first to give a critical history of Arabic traditions ("Muhammedanische Studien," ii. ), and that his estimates, of Arabic civil and religious law have withstood the test of criticism. He has likewise placed the various theological movements which have arisen within Islam in their true light, and his knowledge of ancient Arabic poetry has enabled him to make valuable contributions to the knowledge of pre-Mohammedan paganism. Jewish science is likewise indebted to him; he has pointed out the traces of Hebrew mythology in the Bible, and has presented comparative studies of Jewish and Arabic folk-lore and culture in the Middle Ages. 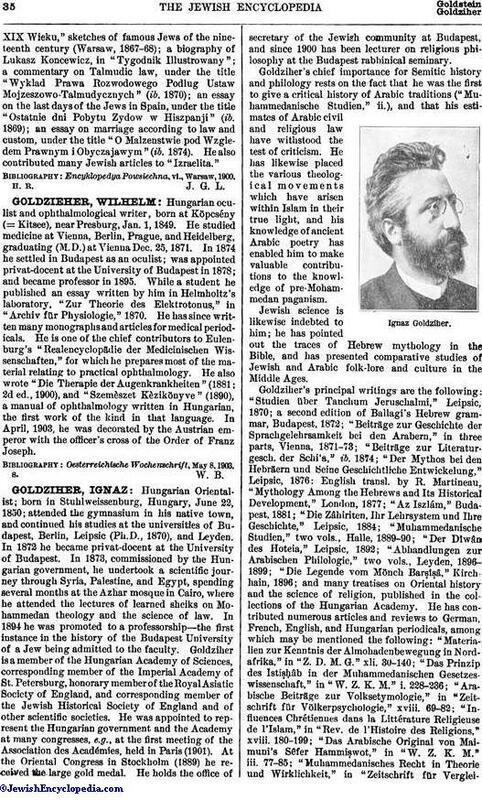 Goldziher's principal writings are the following: "Studien über Tanchum Jeruschalmi," Leipsic, 1870; a second edition of Ballagi's Hebrew grammar, Budapest, 1872; "Beiträge zur Geschichte der Sprachgelehrsamkeit bei den Arabern," in three parts, Vienna, 1871-73; "Beiträge zur Literaturgesch. der Schi'a," ib. 1874; "Der Mythos bei den Hebräern und Seine Geschichtliche Entwickelung," Leipsic, 1876: English transl. by R. Martineau, "Mythology Among the Hebrews and Its Historical Development," London, 1877; "Az Iszlám," Budapest, 1881; "Die Zâhiriten, Ihr Lehrsystem und Ihre Geschichte," Leipsic, 1884; "Muhammedanische Studien," two vols., Halle, 1889-90; "Der Dîwân des Hoteia," Leipsic, 1892; "Abhandlungen zur Arabischen Philologie," two vols., Leyden, 1896-1899; "Die Legende vom Mönch Barṣîṣâ," Kirchhain, 1896; and many treatises on Oriental history and the science of religion, published in the collections of the Hungarian Academy. He has contributed numerous articles and reviews to German, French, English, and Hungarian periodicals, among which may be, mentioned the following: "Materialien zur Kenntnis der Almohadenbewegung in Nord-afrika," in "Z. D. M. G." xli. 30-140; "Das Prinzip des Istiṣḥâb in der Muhammedanischen Gesetzeswissenschaft," in "W. Z. K. M." i. 228-236; "Arabische Beiträge zur Volksetymologic," in "Zeitschrift für Völkerpsychologie," xviii. 69-82; "Influences Chrétiennes dans la Littérature Religieuse de l'Islam," in "Rev. de l'Histoire des Religions," xviii. 180-199; "Das Arabische Original von Maimuni's Sêfer Hammiṣwot," in "W. Z. K. M." iii. 77-85; "Muhammedanisches Recht in Theorie und Wirklichkeit," in "Zeitschrift für VergleichendeRechtswissenschaft," viii. 406-423: "Der Chaṭîb bei den Alten Arabern," in "W. Z. K. M." vi. 97-102; "Der Divân des Garwal b. Aus Al-Huṭeja," in "Z. D. M. G." xlvi. 1-53, 173-225, 471-527; xlvii. 43-85, 163-201; "Le Dénombrement des Sectes Mohamétanes." in "Rev. de l'Histoirc des Religions," xxvi. 129-137; "La Notion de la Sakîna chez les Mohamétans," in ib. xxviii. 1-13; "Ṣâliḥ b. 'Abd al-Ḳuddûs und das Zindikthum Während der Regierung des Chalifen Al-Mahdi," in "Transactions of the Congress of Oriental Languages," 1892, ii. 104-129; "Mohammedan Propaganda in America" (Hungarian), in "Budapesti Szemle," lxxix. 45-60; "Sa'd b. Manṣûr ibn Kammûna's Abhandlung über die Seele," in "Steinschneider Festschrift," pp. 110-114; "Neue Materialien zur Litteratur des Ueberlieferungswesens bei den Muhammedanern," in "Z. D. M. G." 1. 465-506; "Ueber eine Formel in der Jüdischen Responsenlitteratur und in den Muhammedanischen Fetwâs," in "Z. D. M. G." lxxx. 645-652; "Die Sabbathinstitution im Islam," in "Kaufmann Gedenkbuch," pp. 86-102; "Proben Muhammedanischer Polemik Gegen den Talmud," in Kobak's "Jeschurun," viii. 76, ix. 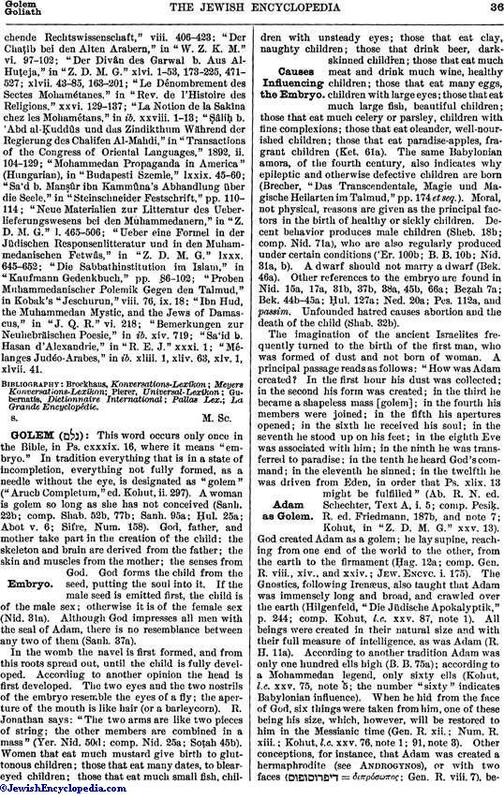 18; "Ibn Hud, the Muhammedan Mystic, and the Jews of Damascus," in "J. Q. R." vi. 218; "Bemerkungen zur Neuhebräischen Poesie," in ib. xiv. 719; "Sa'id b. Hasan d'Alexandrie," in "R. E. J." xxxi. 1; "Mélanges Judéo-Arabes," in ib. xliii. 1, xliv. 63, xlv. 1, xlvii. 41.